iVocabulary is your personal vocabulary assistant. Collect, manage and study your vocabulary and specific terms for school, University, your job or your hobby. 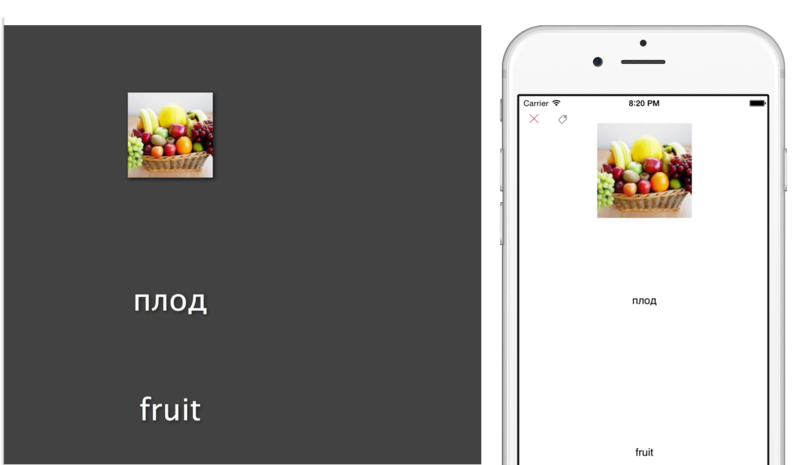 With iVocabulary on your Mac you can collect, manage and learn your vocabulary on your desktop and sync them via iCloud or Dropbox to iVocabulary on your iPhone, iPad or iPod touch to learn while you’re on the way. Besides collecting your own vocabulary, you can download any of the around 3700 collections created by users of ProVoc. Organize your vocabulary in books, chapters and lessons. All devices are kept in synch via iCloud or Dropbox. Record audio and add an image to your vocabulary. Learn new vocabulary with a slideshow. 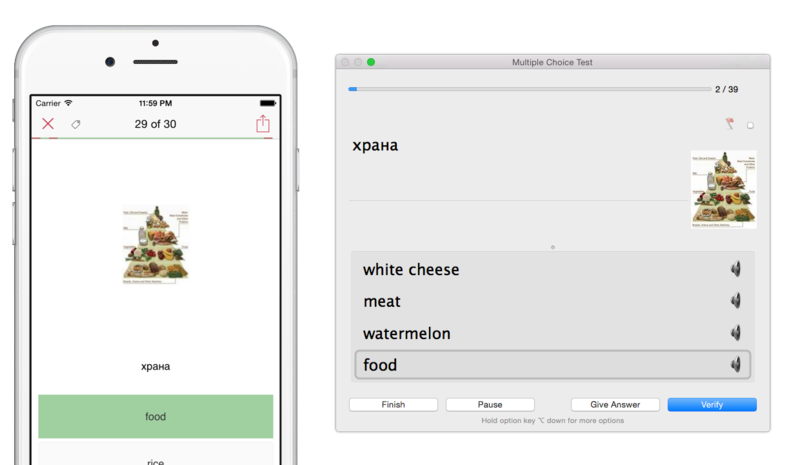 Train your vocabulary with learning cards, multiple choice or written tests. See your learning results in a pie chart and your learning progress in a bar chart. On your iPhone, iPod touch and iPad you can try iVocabulary 3 for free! The free version is limited to 30 words in a maximum of 2 books, you can unlock the unlimited version from inside the app. iVocabulary is your electronic vocabulary book. Collect your words and add a picture or record a voice and tag your vocabulary with a colored label. Each word has a difficulty that’s calculated as you learn. Lean back and learn words with a slideshow that presents unlearned vocabulary and plays along the recorded audio. Since iVocabulary is not available for Windows or Linux, it provides is a simple vocabulary editor you can use with your browser. In iVocabulary you activate WiFi availability (in global settings) and then enter the address in your browser. To learn, you first choose what lessons you want to learn. You do this by tapping the checkboxes on the right in the vocabulary overview. The sync status says ‘idle’… what does that mean? In short: there’s nothing to do for sync. The sync works by exporting the changes to a folder that is then synced by iCloud. iCloud then uploads and downloads those files to the other devices, where iVocabulary then imports the changes in the local database (Dropbox works the same but the changes are up-/downloaded by iVocabulary). In this context, ‘idle’ means iVocabulary did it’s work and the sync service is now in charge to upload / download the data, or, if that’s already finished, there’s nothing to do (aka no new files available). iCloud sync doesn’t find any data? Only the first part of my word is shown when practicing? Most definitely you used the synonym seperation without knowing it exists. As a default, the slash (/) is the seperation character. In iVocabulary you can store synonyms of a word in just one entry. You don’t need to store two entries with the same translation but can store it in one entry. When practicing, synonyms can be trained seperately. You can disable this in the settings (general). How can I share documents for others to download? At the moment iVocabulary doesn’t support uploading content to th download area, but you can share via eMail or messages. The currently available files are hosted and provided by Arizona, the former developer of ProVoc. The files were created by the ProVoc community. Sharing is planned for a future release.